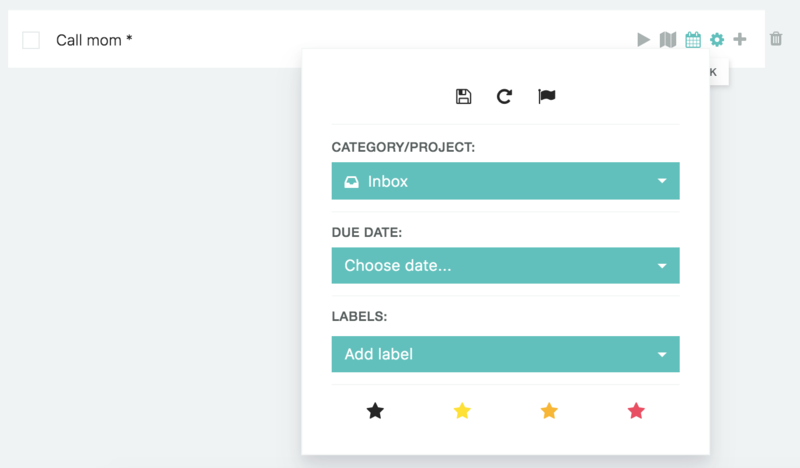 In Marvin you can assign three priority levels to tasks and projects via the "Priority stars" strategy. You can assign a priority level to a task or project with the * shortcut. Use the shortcut when creating the task or by editing the task title (click title to edit) on an existing itme. After you type * there will be an autocomplete menu where you can pick the desired level with your mouse or the arrow keys/enter keys. You can also start typing the level you want -> Red Star, Orange Star, Yellow star. If you don't want to use the shortcuts you can also click on the edit icon (cog) of the task and add stars at the bottom of the mini dialog. The black star removes the priority level completely. In your day view ("My day") the priority stars on tasks are shown to the left of the task (instead of inside on the right like everywhere else). Clicking the star on the left cycles through the levels and allows you to remove or add a star quickly.